If you need to set up a new Gmail account for your Galaxy S6, you have a few steps to follow. Before you get into the steps, think up a good user ID and password. Gmail has been around for a while. That means all the good, simple e-mail addresses are taken. Unless you plan to start using this e-mail account as your main e-mail, which you could do if you wanted, you’re probably best off if you pick some unusual combination of letters and numbers that you can remember for now to get through this process. Here is a confusing part. The icon on the left in the following figure is the Gmail app. The icon on the right is for the general e-mail app. The general e-mail app is for your combined e-mail accounts. The general e-mail account is the app that you will use to access any and all of your e-mail accounts. 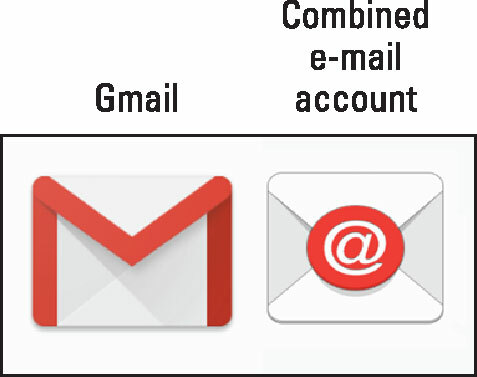 The E-mail and Gmail icons. Tap the Gmail icon. Tap the Or Create a New Account hyperlink. 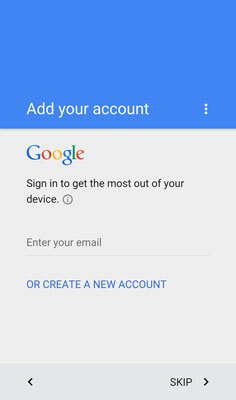 Because your phone does not know if you have a Gmail account yet, it offers you the option of entering your Gmail account or creating a new account. Enter your first and last names on the screen and tap Next. Google asks for your name in the screen that appears. This is how they personalize any communications they have with you. You may be tempted to use a fake name or some other clever two-word combination in place of a name. Don’t do it. You will still be getting e-mail to “Rita Book” or “Warren Peace” long after the humor has worn off. 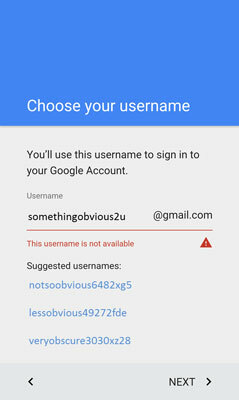 Enter the username you want to use with Gmail and tap Done. On the screen shown, enter the username you want. Hopefully you get this name approved on the first shot. If your first choice isn’t available, try again. There is no easy way to check before you go through these steps. Eventually, you hit on an unused ID or you will use one of the suggestions in blue font. When you’re successful, it will congratulate you. Accept the terms and conditions of the account. You may want a lawyer to review these terms and conditions. Or not. Basically, the terms are that you should be nice and not try to cheat anyone. Don’t abuse the privilege of having the account. Prepare a security question and an alternate e-mail address. If you forget your password, Google wants to verify that you’re really you and not someone pretending to be you. Google does this check by sending a confirmation e-mail to another account or sending a text to your phone. You can do this now or tap Skip to do it later. After you tap Done, light flashes and you see the screen working away. This process usually takes less than two minutes. While you wait, you’ll see all kinds of messages that it’s getting ready to sync things.